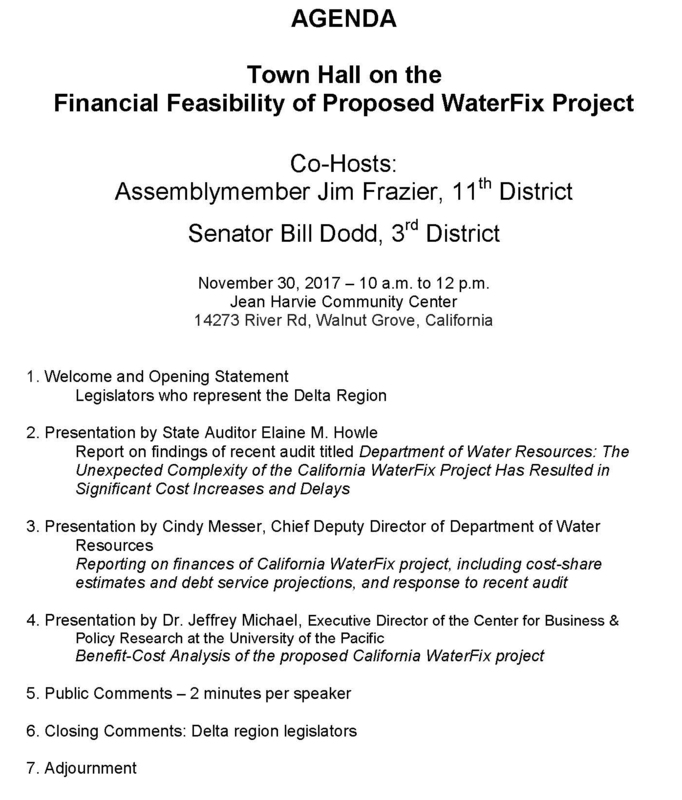 Senator Bill Dodd (D-Napa) and Assemblymember Jim Frazier (D-Discovery Bay), the co-chairs of the Delta Caucus, will hold a town hall in Walnut Grove on Thursday, November 30 to examine the financial feasibility of Governor Jerry Brown’s controversial Delta Tunnels project and discuss related concerns, including recent findings by the State Auditor. The hearing will be held at the Jean Harvie Community Center, 14273 River Road, Walnut Grove, from 10 am. to noon. Members of the public are invited to attend, according to a press release from Dodd’s Office. The audit revealed extensive mismanagement by the Department of Water Resources (DWR), including the violation of state contracting laws, spending millions of dollars over anticipated costs, and failure to complete either an economic or financial analysis. The 97-page report said DWR broke state contracting laws when they replaced the program manager for the California WaterFix, formerly called the Bay Delta Conservation Plan (BDCP), a proposal to build two massive 35-mile long tunnels under the Delta to export Sacramento River water to agribusiness interests in the San Joaquin Valley and Southern California water agencies. The audit summary pointed out that although DWR used a “robust selection process” to select its first program manager, the URS Corporation, it later used “other methods” to select a replacement program manager, the Hallmark Group. 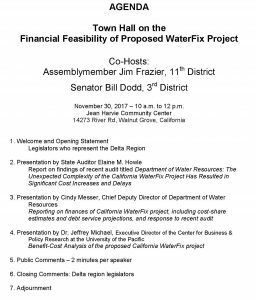 Cindy Messer, the Chief Deputy Director of the Department of Water Resources, will report on the finances for the California WaterFix project, including cost-share estimates and debt service projections, and the response to the recent audit. Members of the public will have an opportunity to provide their comments, limited to 2 minutes per speaker. Delta Tunnels opponents, including Restore the Delta and North Delta Cares, are encouraging the public to attend and provide public comment. “Our Delta legislators are hosting a public examination and hearing on the blistering state audit report on the tunnels. We hope to see you there!” said Barbara Barrigan-Parrilla, Executive Director of Restore the Delta (RTD). The Delta Caucus is a bipartisan mix of 12 members of the Assembly and Senate who represent the Delta region. The Caucus is co-chaired by Assemblymember Frazier and Sen. Dodd. Other members include Senators Cathleen Galgiani (D-Stockton), Steve Glazer (D-Orinda), Dr. Richard Pan (D-Sacramento) and Assemblymembers Cecilia Aguiar-Curry (D-Winters), Kevin McCarty (D-Sacramento), Jim Cooper (D-Elk Grove), Heath Flora (R-Ripon), Susan Talamantes Eggman (D-Stockton), Timothy S. Grayson (D-Concord) and Catharine Baker (R-Dublin).